I've uploaded V0.9 to the downloads page! Please check it out as it is a significant improvement over earlier versions. I do not have time tonight to rework all the text below.. but rest assured I will soon! (There is a PDF help guide included in the download). I have updated the changelog below though. 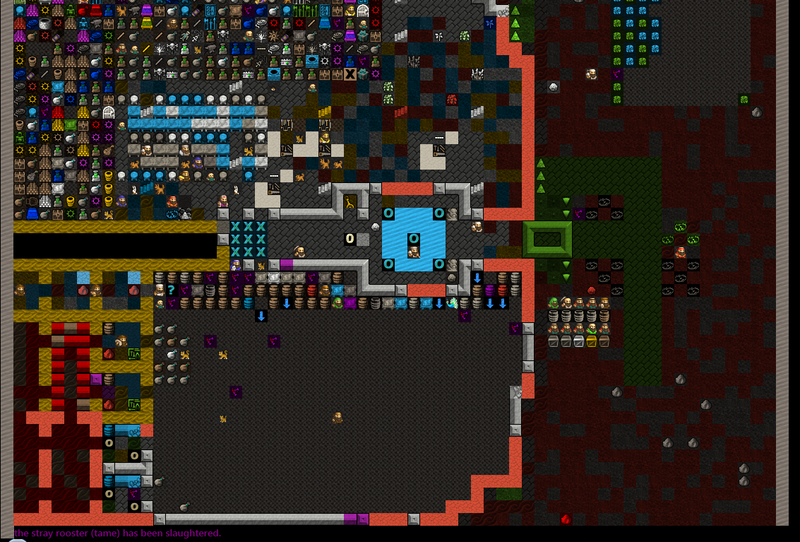 - Monitor now only stays ontop of dwarf fortress, rather than ALL windows. 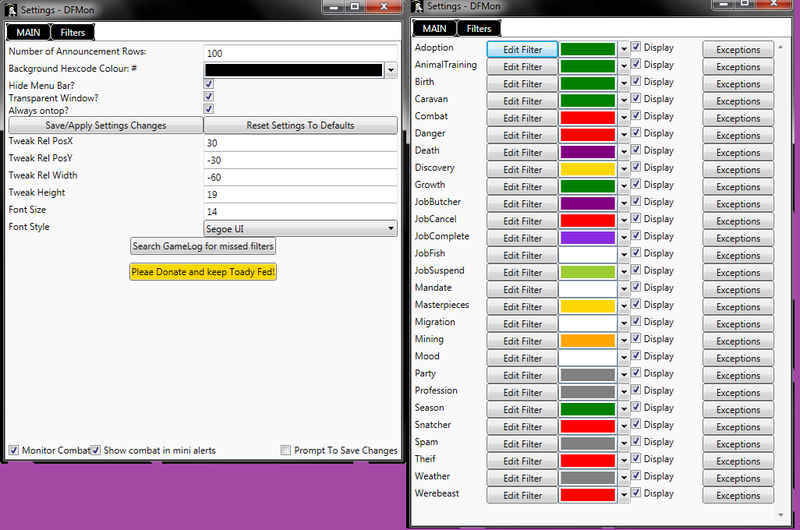 - QuickButton in mini monitor lets you filter text items more efficiently as they appear and annoy you. - Removed settings option to have monitor "always on top"
- removed the need for the program to fullscreen dwarf fortress when opening. - You can now have as many/few monitors as you like and take full control of them. - Add checks that text isn't already matched by another filter. - Check if spam timer resets when new spam is recieved. COuld do with a visual display such as a count? Does this apply to individual text strings OR text strings per filter OR per filter? - Read colours from data/init/colors.txt for defaults. - Look into making NAMES more distinctive and unique to make reading combat reports easier. - Some code simplfication now reduces amount of text parsing when extreme amounts of messages are being reported quickly. - fixed a bug where all messages were being displayed in lower case. - Fixed a bug where long lists of filters caused the filter/exception editing pages to overflow off the screen. - Settings window is now brought to foreground if you try and open it when it is already open in the background. - New homescreen for launching the monitor... Lets you edit settings without running the program and also means you can open it when dwarf fortress is closed! - Added a second donation button and a personal reference. - You can now choose how long messages are displayed for on the mini monitor (minimum one second, and doesn't work in realtime, so you won't always get your message to disappear in XXXX milliseconds... but it is close enough). - You can now choose how often to display repeated messages in terms of time. Setting a SPAM TIME of 30000 milliseconds will only show you any one unique message at most once every 30 seconds. Value can be set in milliseconds with a maximum value of 60000 ms(60 seconds) to keep memory overhead down. Default value is 1 second, but I'd increase this! - Added detection/display of gamelog/df window to homescreen instead of on monitor launch and removed closing if not found. Status display now instead. Detection happens when you try and start the monitor, but also optional buttons to manually do it. - Default width no longer obscures happiness counter. - When mini monitor is resized, it's width is saved to current settings so that resizing/moving dwarf fortress doesn't cause it to jump back to it's original width. - Help documentation now available. Inspired by 100s of annoying job cancellation requests I've thrown together a program to do away with spam and replace the in game alerting system.... It's pretty nice. Setup a list of categories to display and then what alerts you want to display within them. ALL other game text is hidden, effectively removing spam. Choose precisely what alerts to PAUSE and ZOOM on. Zooming is a bit buggy though! 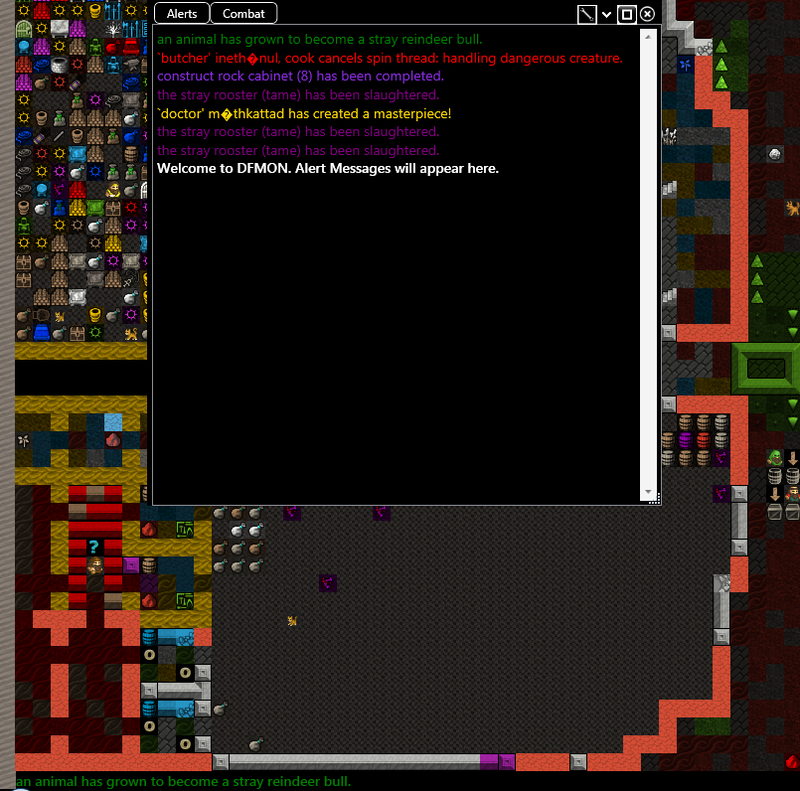 Font colors are NOT yet precisely the same as in dwarf fortress by default, but can be customized to be so. Font style and size are the same for all announcements. If it won't work *AT ALL* then you need to install .NET 4.0 on your computer... I'm hoping that won't be the case though! Nice work. Funny to see something like this pop up out of nowhere... I thought TheGazelle was working on something like this? It appears your lower bar completely hides the entire bar that DF puts there, including the happyness counter that falconne added with dfhack. Does this somehow support custom announcement done by dfhack? Many scripts give user feedback, for example siren. Will it show in your external window? - To operate correctly the program has to be able to recognize every single line of text from the dwarf fortress log (or else how would it know the difference between a missed line and one we actually want to filter?). Do all these announcements write to gamelog.txt? If so it would be simply be a case of adding them to the filter you want them to appear under. If they do something more clever and inject text straight into dwarf fortress somehow then currently this won't be picked up by my tool. A useful thing to do is open up the settings and run your game log through the "Search Gamelog for Missed Filters". This will tell you what, if any gamelog text is NOT being picked up correctly by my tool. Currently it ignores some world gen stuff. If they do something more clever and inject text straight into dwarf fortress somehow then currently this won't be picked up by my tool. They do exactly that. No gamelog entries. Dfhack can make those, but most scripts just decide not to, because no reason for it exists (existed?). And Wow, someone who can write C++ and do overlays... can I borrow your skills for stupid dwarf tricks ? PTW, this looks great. Between this and The Gazelle's gamelog parsing stuff, maybe we should launch a campaign to have best practise for scripts that insert announcements to also write to the gamelog. It does flag availability of combat, sparring, and hunting reports, but there's plenty of room below that. - Is there some way to define a relative path, for newb-friendly-ness in my LNP? You can use the "tweak" options to change the width and position of the minibar. Thanks Meph, I'll look into that. As for doing some interface stuff for you... I'm happy to give it a go! C# is not c++ though.... but I should really get my finger out and learn some more c++ anyway! C# is what I use at work so when time is limited (which it always is) I prefer to use it. So far, it is working as intended and I'm on Windows XP using the Masterwork Mod. I'm going to be using this for combat alerts though. Is there anything you would like different with the combat alerts? I was considering changing the combat filters to be a few separate things like "Direct combat", "Status Updates", "Environmental Hazards", "Combat Spam"
- Option to pause on specific filters. - Proper DF alert message colours. 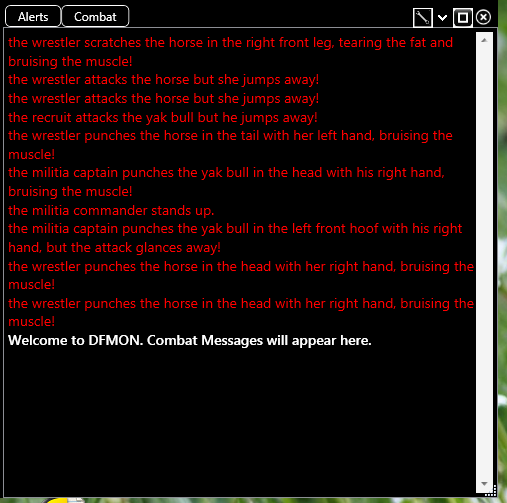 I would prefer that the combat alert to be separated into two things: sparing and everything else. Both windows are not transparent even if I set them to be transparent. If I want to run it, I have to delete the current settings and let it run on using the default settings. It will crash if I tried to change and save a setting. I modify the settings I want onto the default settings file to get around it. The df window will maximize every time I do this, but I don't mind it when I can resize it. 00112: If you run it with Masterwork you will not see the custom announcements I added, which is not too bad if you know the mod in and out. Otherwise you are missing out on some crucial info, mostly about the researcher. Ravendarksky: I'll send you a PM. This is a particularly good addon for people running multiple monitors. You can jack up the font big time and just plop a whole window for announcements on another screen. 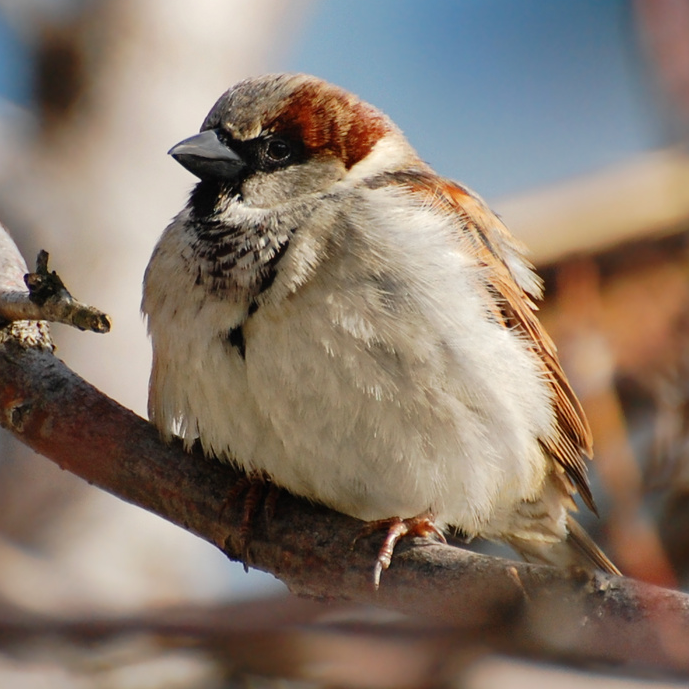 The hands down biggest perk for me is gonna be the first time some birds dive bomb my citizens or a siege pops up out of no where, I just can't wait to be able to filter out all the "runs away" spam and actually see the combat. New version is out! Addresses most of the issues people have mentioned as well as a few significant improvements. - Can now filter by multiple seperate keywords ie job AND cancel AND web will only match alerts which contain all of these words.